Before I begin today's Life with Lynnie (LwL) entry, I would like to wish my daughter P's boyfriend K, a very Happy Birthday! May God bless you today, on this your special day, and throughout the coming year! In addition to being K's birthday, it is also Valentine's Day! Happy Valentine's Day! 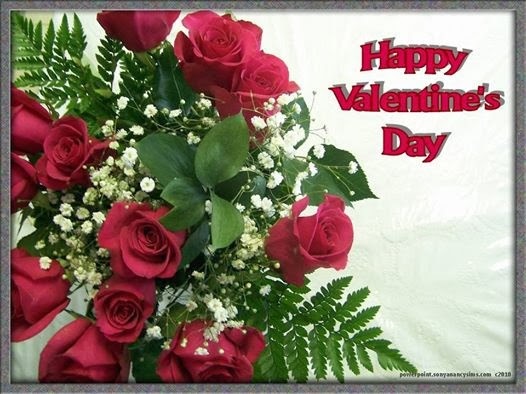 Valentine's Day is a day when love is celebrated. Love is shown in so many ways. By so many people. I came across a video that speaks of love. In a different way. Here is a link to the Youtube video entitled, Falling Plates: http://www.youtube.com/watch?v=KGlx11BxF24 . It's a loving video that I believe all need to see. I pray you'll take the time to watch it. If you've watched it, you'll be aware that it speaks about the love of God. God's love for us, is so very different than what we humans show and/or feel as love for others, here on earth. Just as He told us, in 1 John 3:1, "Behold, what manner of love the Father hath bestowed upon us, that we should be called the sons of God: therefore the world knoweth us not, because it knew him not." God loved us so much that He sent His only begotten Son, to die on a wooden cross, and to be resurrected to eternal life. This way, all who believe upon Him, shall be saved. Yes, He calls us His children... His sons. And, just as the Bible verse tells us, the world sometimes does not know us, or accept us. Why? Because, the world didn't accept Jesus, as Lord and Saviour. How I praise God for His plan of salvation, for me. For you. For all/any who will believe upon/trust in our Lord, Jesus Christ! There's no greater love than this, my friend. So, I will wish you Happy Valentine's Day! Know that I love you. Just as I love my Lord.